The Aqua Saga at Orlando Fringe Opens! I am so excited over all this good press, but am more excited that audiences are leaving with smiles on their faces! Big thanks to Joseph for help on that one! I hope we get a good turn out for the show. The Aqua Saga opens at Fringe on May 15th at 8:30pm in the Purple Venue. 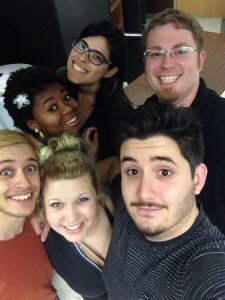 Check out a quick selfie we took with the cast and crew!